The NEMOX Gelato Pro 2500 AUTOMATIC Ice Cream & Sorbet Maker. Capacity 3 quarts - production per hour. Stainless steel case. Stainless steel mixing paddle. More powerful refrigeration. One removable aluminum bowl included. 120V/60Hz/280W/1 Phase. S/S case and mixing paddle. 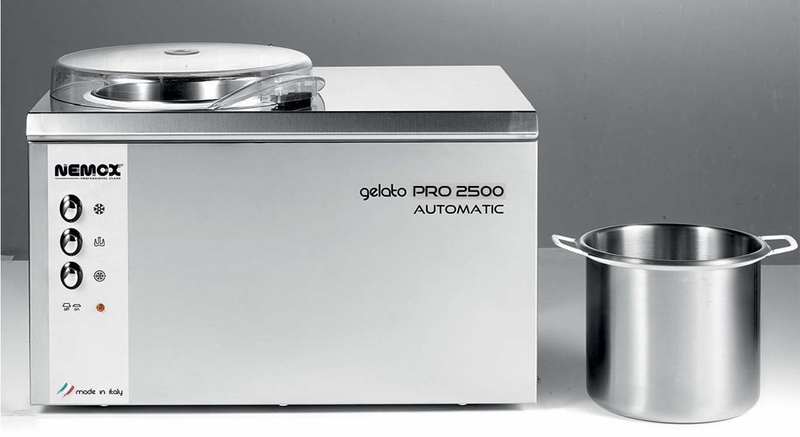 Gelato Pro 2500 AUTO is a new version of the most compact professional ice cream machine on the market. While the new version of machine has the same production capacity and timing, it also offers a mechanical conservation system that allows to leave the Gelato in the machine for a few hours (density-based only). Processes up to 1.2 kg of mixture in a very small space. 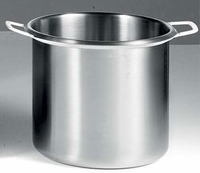 Use either the fixed bowl made of 18/10 Stainless Steel, or the removable anodized aluminium bowl for easier cleaning. The refrigeration and blending systems are designed for long work cycles. The plastic mixer blade is made of "POM", a technical polymer that ensures hygiene and strength. Thanks to the unit cover, made of hardened glass, you can conveniently use the machine as a counter top when not in use. The bowl comes with a plastic lid. The machine body is entirely made of stainless steel. The blender motor is provided with an automatic reset thermostat. Stainless steel machine body. The blender motor is provided with an automatic reset thermostat. Safety Interlock stops stirrer paddle, when Lid is opened. 120V - 60Hz - single phase current, with USA cord and plug, works in any regular USA 15 AMP outlets. 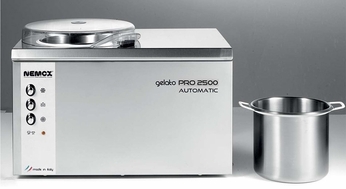 GELATO Pro are the only professional machines provided with removable bowl. Preparation time: 20-30 min., based on the amounts and type of ingredients. The shipping cost could be adjusted after order placement upon determination. Very happy with this purchase, and it arrived faster than I expected. It makes dense gelato with minimal air incorporation. My typical batch is a little over a quart and it goes from body temperature to frozen in about 20 minutes. I can make a batch in about 40-50 minutes start-to-finish by placing the hot pan in sink with cool water and stirring for 5 minutes to bring the temperature down fast. Clean up is easy with the removable bowl. The Nemox Gelato Pro 2500 instruction sheet recommends turning the refrigeration button on five minutes before you pour in the gelato custard. If this is done, the custard instantly freezes to the side of the bowl, locking the mixing paddle. I would recommend to skip this step and turn the refrigeration unit on with the chilled custard already in the bowl and just before the motor is turned on. I made perfect gelato in less then 15 minutes this way. Thanks again, John Osborne.